In order to start your holiday in Canada in a relaxed atmosphere, it is advisable to pick up the car you have rented in advance directly after arriving at Toronto Pearson International Airport. Our independent comparison portal allows you to compare the numerous offers of our renowned partner car rental companies at Toronto Pearson International Airport quickly and conveniently. Find your cheap rental car at Toronto Pearson International Airport and fly with confidence to your holiday destination! Toronto is Canada's largest city. About 2.6 million people live here. It is also the capital of the Canadian province of Ontario. Situated on Lake Ontario, Toronto is only 100 km from the USA. Because Toronto is located in the south of Canada, it has a very pleasant climate. Nevertheless, all four seasons are clearly marked. In winter you can expect snow from November to April. The average summer temperature is about 25 degrees Celsius. With your rental car, which you can pick up at Toronto Pearson International Airport, you can explore not only the city but also the surrounding area in a flexible and comfortable way, without having to rely on public transport. The city itself has many attractions to offer, such as the CN Tower, one of the tallest freestanding buildings in North America. It was completed in 1976 and is about 550 meters high. For a long time, it was therefore regarded as the world's highest television tower until it was replaced by the Chinese Canton Tower. Rent a cheap online car of your choice and discover Toronto's attractions in comfort by renting a car. Toronto Pearson International Airport, or YYZ for short, is about 27 kilometers from the city. The cities of Hamilton and Mississauga are also close to the airport. Located at the airport terminal, you can taste international and national dishes and drinks in various restaurants and bars. You are at the terminal in front of and behind the security checkpoints. In the Yorkville Grill you can get small dishes and various snacks. Small snacks are also available at the Pumpernickls and Meteor Diner. Coffee is served in the Mozaiks Café and Starbucks, located in each terminal. Beer, cocktails and other alcoholic beverages are available at Bar 120. The national currency is the Canadian dollar. You can also exchange your money at Toronto Pearson International Airport in one of the exchange offices or banks located at the terminal. Travelex Canada Limited Bank is located in each terminal. If you only want to exchange money, you can do so at ICE Currency Services. If the exchange office and bank are closed, you can use the ATMs at YYZ Airport, which are available around the clock. At each terminal there are pay Internet access points that passengers can use. Letters and postcards can be delivered to the mailbox located on the third level of the terminal. You can use printers, faxes and copiers in dedicated areas. You can make calls on the many public telephones at the terminal. There are also numerous shops at YYZ Airport. Before you pass the security check, you can look around in the various shops selling perfume, clothing and shoes, jewellery or electronics. Here you can buy high-quality textiles, regional products or souvenirs. You can relax at the airport in Canada with a massage offered at the Salon Vaccaro Spa. There's manicure there, too. As soon as you have passed the security checkpoints at the terminal, you can also take a look around in the duty-free shops. Here you can obtain regional products, tobacco, perfume, souvenirs and alcoholic beverages tax-free. Books and international magazines are also available for sale in all areas of the terminal. With your rental car, which you can book here, you will discover the sights of Toronto and its surroundings. Cheap flights with various airlines are also available. Toronto Pearson International Airport is the most important airport in Canada with a high passenger volume. Here you can make use of various services that can bridge long waiting times. Take a look at the gallery or the airport museum, for example. Both are accessible to passengers and allow an informative look behind the scenes of the airport. After landing at YYZ airport, you will be taken to the car hire desk where you can pick up your rental car, which you can rent here at reasonable rates. Also book low-cost flights from different airlines. Your luggage can be transported in the entrance area with a luggage trolley. The airport also offers lockers that are suitable for storing your luggage if you have to spend a long time at the airport. If your luggage is lost at the airport, please contact the lost and found office. After the flight, your baggage will be taken to one of the different baggage carousels located at the airport. The flight crew will explain to you which band you have to go to. After you have received your luggage, you will be taken to the pick-up point of your car rental company. Here you can pick up your rental car and travel comfortably to Toronto. Rent a car and flights from different airlines for less money. Where are the Car Rental counters at Toronto Pearson Airport? The airport is home to several companies that offer car rental services, including Hertz, Avis, Dollar/Thrifty, Budget and National. The rental car counters are located in the arrivals hall. However, it is also possible that you will be met by a member of the car rental team. Pick up your rental car at the pick-up station at the airport. Here it is possible to rent cheap online a car and flights of different airlines. After all the formalities have been clarified with the car hire agent, he or she will take you to the pick-up point where you will receive your rental car. Rent a car and flights from different airlines for less. Where is the nearest petrol station to the airport? Depending on the arrangements you have made with your car rental company, it is important to know where the nearest petrol station to the airport is located so that you can return your car with a full tank of fuel. There is a Shell petrol station on the Airport Road in Mississauga. With the rental car, which you can rent cheaply here, it goes then comfortably to Toronto to your hotel or different places of interest. Are you travelling by car in Toronto and the surrounding area? Then you can use various motorways from the airport, for example the 400,401 and 403, which guarantees an ideal connection to the airport. Via Highway 427 and the Gardiner Expressway you can reach downtown Toronto by the fastest way. Pick up your rental car at the car hire pick-up point and explore Canada in a comfortable way. Here you can rent a car of your choice. If you are traveling in Canada by rental car and departing from Toronto Pearson International Airport, you are strongly advised to keep to the speed limits, as they are often checked by the police and will be fined for violating them. The respective maximum speeds can be found in the table below. The per mil limit differs by province, but in Toronto it is 0.8, but drivers under 21 years of age and beginners must observe the per mil limit of 0.0. In Canada, seat belts are compulsory for all passengers. Furthermore, adults are responsible for all children under 16 years of age. In Canada it is allowed to overtake on the highway to the right. Therefore it is recommended to pay attention to the right lane when reeving. Your rental car will take you from the airport to your hotel or to the sights of the city. Rent a car for less or book cheap flights from different airlines. 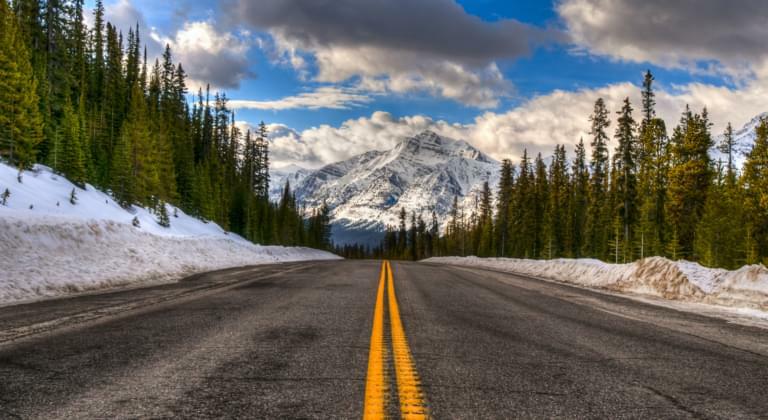 What is the speed limit in Canada? Once you have received your rental car at the Toronto Pearson International Airport pickup point, you will travel from the airport to Toronto's attractions. The Fairmont Royal York Luxury Hotel is one of the city's most impressive buildings. Drive from the airport with your rental car and have a look at the building. It is located opposite the main station and offers its guests more than 1,600 rooms. This is where the British royal family will be accommodated if they are on a state visit to Canada. The different heights and gradations ensure that the hotel resembles a castle. Beneath the city itself is a 28 km long tunnel network, one of the largest underground cities in the world. Here you have the possibility to go shopping in different shops and stores. Numerous buildings such as the Air Canada Centre, City Hall or CN Tower are connected to the system. Drive from YYZ airport to Toronto by rental car and also see the city's parks and gardens. Rent a car for less and get it at the pick-up point of the car rental company. What places of interest should you not miss in Toronto? Toronto has more to offer than impressive buildings. There are over 200 parks and gardens in the city that invite you to take a walk. The High Park in the west is Toronto's largest park, covering more than 160 hectares. Toronto Zoo is the third largest zoo in the world with more than 5,000 different animal species. Each year, over 1.2 million visitors visit the zoo, located in the northeastern part of the city. Rent a cheap, online car at the Toronto Pearson International Airport car hire pickup point and explore the city in comfort.